Hello friends, In my previous articles I wrote about all the basics of Linear regression. In this article I will tell you one of the several use of Linear Regression. And in this article we will learn about “how to classification using Linear Regression in R”. Introduction to Linear Regression model (optional). 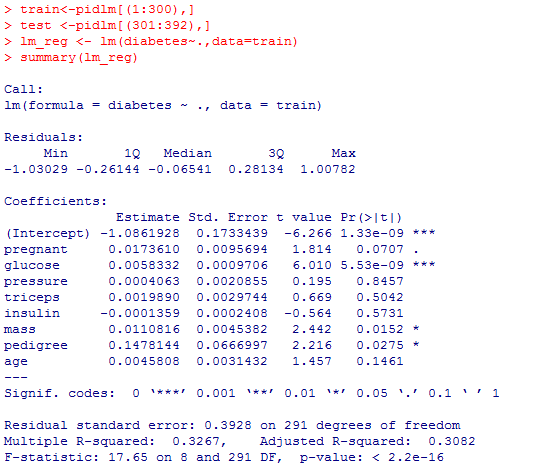 Linear Regression Analysis using R (must have knowledge how to do regression on R). As we know that linear regression is most widely used in predictive analytics. And Here in this article we will use this for classification. First of all open R or RStudio and set your working directory. Step 1: First install “mlbench” package. > package.install(“mlpackage”) ↵ (press enter). Step 2: Load the installed package using the liberary command. The data contains 392 women with pimaindianheritage, they were tasted for diabetes. Pregnant : Number of times she got pregnant. Glucose : Glucose tolerance test. Triceps : Skin thickness (mm). Insulin : 2 hr Syrum of insulin (miliunit/ml). Mass : ratio to weight to height(bmi)[kg/m²]. Pedigree : diabetes pedigree function. Age : How old she is(year). Diabetic : whether she is positive or negative. In the above image you have seen that there is some missing values in insulin variable. Lets look into the complete data to check the missing values. The missing values can be fixed. There are 768 total observations. 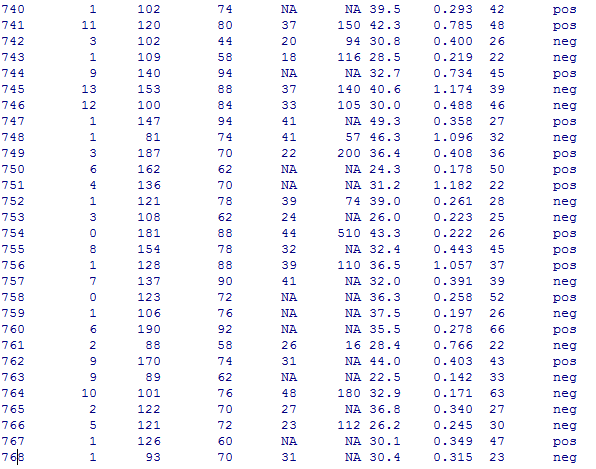 After omitting the NA values from the data-set only 392 valid observation remains. and ‘pidna’ is the new variable where we have save the “PimaIndiansDiabetes2”. Here we have set like this that it will come as 1-positive and 0-negative. NOTE: Don’t get confused with the response variable(diabetes) having values 0 or 1. Thes are not in binary form they are just numeric number. If we set this command like this pidlm$diabetes <- as.numeric(pidna$Diabetes)-2 then the response values should be like -1 or 0. Now we can use this data-set for linear Regression from this data-set we will make two different data-set one is training set and the other is testing set. NOTE:If you are getting dimension error in your R command just remove ‘,’ and try. Here in this summary, we will conclude that who has diabetes and this summary coefficient will tell us this. We are assuming this if the predicted value is greater than 0.5 then, we will consider it as a positive case, Otherwise it will be a negative case. From the table we can say that there are only 62 cases with the diabtese. 9+21 of women with ‘1’ diabetes values. 21 women are predicted true with the logic of predicted > 0.5, which they are successfully predicted. 9 women cases where predicted value < 0.5 giving the predicted value ‘0’ even though the original value was ‘1’. 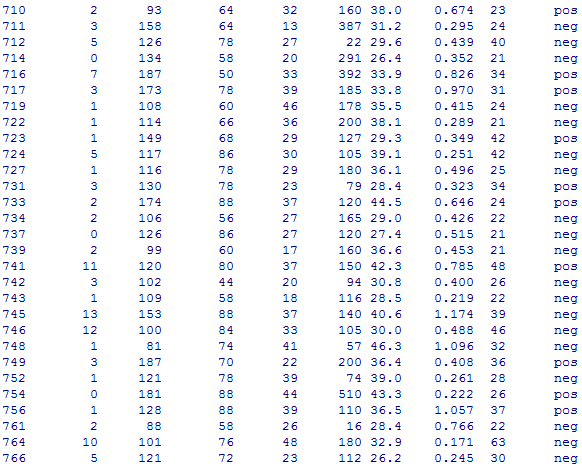 Number of successful prediction are 78 while the total number of test cases are 92.
diag[tab]= total predicted correct value. sum(tab) = total predicted value. We are not limited with predicted >0.5, we can change the predicted value and see the other value results. From the table we can say that there are only 62 cases with the diabetes. 10+20of women with ‘1’ diabetes values. 20 women are predicted true with the logic of predicted > 0.7, which they are successfully predicted. 10 women cases where predicted value < 0.7 giving the predicted value ‘0’ even though the original value was ‘1’. As if you will change the value of predicted less than 0.5 then the results will be different. EDIT: If you have any doubt or found any mistakes please post it on comment we will look into the mistake. I am not sure lm reg suitable for this data, because dependent variable is category variable. It violate assumption that errors are iid normal. If we choose logistic regression, it should be better or not? spondars, you are right the data is having categorical dependent variables, see step5 I have changed the categorical into numeric, 1-negative and 2 for positive. Overfitting problem and R2 is very small. @alberto, here in this example we are calculating Diabetes victim and in this dataset we have tested these observations with some varibles like which can casue diabetes, if the r^2 is less than this means all the variables are not significant to cause Diabetes. A logit model (or arctan as well) should be more suitable to predict a dichotomous DV, since the ordinary lm prediction exceeds the allowed range of [0;1]. For the lm-method you introduced: A subsequent ROC analysis could give some useful information on the diagnostic quality of the model and provides the opportunity to determine the cutoff value of minimal decision error in the training data (youden index). You are right @ben, I just gave an idea of classification using LM method. @ben you are right, linear regression can’t be used to do classification directly but please go through the article carefully, I have changed the variables to categorical form. If you data is categorical then you can use LM model, as far as I know. If I am wrong please shoot an email @irrfankhann29@gmail.com.